A cruise in China is an ideal way for first-timers to explore the vast, multifaceted – and, to many travelers, intimidating destination. It can be daunting for first-timers to visit China, given the challenges posed by language, culture, population density and vast distances between major cities. That’s why a cruise through this part of the world is a convenient, efficient way for rookies to avoid many of these hassles. Cruisers don’t have to worry about finding hotels or English-speaking guides, arranging ground transportation and other logistics. Last March, my husband and I took a 10-day cruise on the 900-passenger Crystal Symphony from Hong Kong to Beijing, with ports of call in Xiamen, Shanghai and Dalian, and a three-day land extension in Beijing. This itinerary showcased the trio of must-see cities — Hong Kong, Shanghai and Beijing — allowing us to experience them in a way we wouldn’t have been capable of doing on our own, especially within such a short time frame. Our cruise began from a terminal embedded in the centrally located Harbour City mall. This luxury mega-retail complex with its three hotels, 450 stores and 50 food outlets offered an initial glimpse at how westernized China has become since Mao Zedong launched the Cultural Revolution in 1966. While this was my first time in China, my husband had visited the country as part of a medical delegation in the ’70s, when people uniformly wore drab blue jackets, and bicycles greatly outnumbered cars. A flotilla of flat-bottomed sampans, junks with red sails and vintage ferries paraded past our ship on Victoria Harbor. Skyscrapers dazzled along the shore during the nightly 13-minute light show synchronized to music. The next morning, we strolled around on our own, pursued by English-speaking hawkers who profiled us as targets for custom tailors. That afternoon, we opted for one of Crystal Cruises’ myriad shore excursions, this one exploring daily life in Hong Kong. 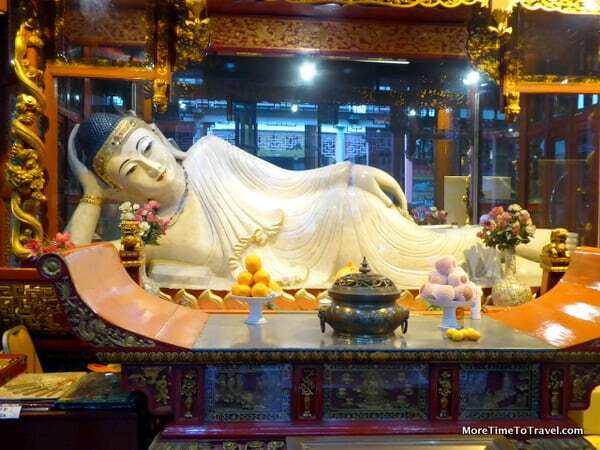 The tour began with a comfortable bus ride to Tin Hau Temple, one of the city’s oldest. With more than 600 temples — half of them Buddhist — Hong Kong has a rich spiritual tradition. The restored 18th century temple, still active with worshippers, was painted in characteristic yellow, red and green with incense coils suspended from the ceiling. Even in this cosmopolitan city, many traditions endure. We passed streets with laundry drying outside windows of high-rise apartments and visited a “wet market” with live animals, where traditionalists shop twice daily for meat, seafood and vegetables. A crowded double-decker tram in service since 1904, called a Ding Ding, transported us to a neighborhood with traditional medicine shops and displays of dried seafood products. A small fishing village until 1842, Shanghai became a commercial trade center thanks to its strategic location on the Huangpu River, a branch of China’s longest river, the Yangtze. Like Hong Kong, Shanghai is a fusion of old and new. The ship docked within walking distance of the waterfront area called the Bund, lined with block after block of historical buildings. By bus, we headed for a 45-second, high-speed elevator ride to the observation deck atop the 88-story Jin Mao Tower, its post-modern octagonal design based on the Chinese lucky number eight. After exploring People’s Square, the political and cultural center of Shanghai, we lunched at the Jin Jiang Hotel, which has received heads of state since 1929. Other stops: the Old City with its colorful souvenir shops and dumpling houses, and Yuyuan Garden, a sprawling public garden with a teahouse, pagodas and bridges dating to the Ming dynasty. One of Crystal’s bespoke tours (with a private driver and guide) took us to the French Concession, a posh area administered by France and popular with foreigners from the mid-19th to mid-20th centuries. On the famed shopping street Nanjing Road, we saw locals lined up to buy qingtuan, or green dumplings, for Tomb Sweeping Day, when people pay respect at ancestors’ graves. On our last day in town, we took an optional excursion to a former Jewish neighborhood once known as Little Vienna. An older guide with roots in the community spoke passionately about the successive waves of Jewish immigration. The Chinese welcomed Jews who arrived in Shanghai after the Holocaust and helped them rebuild their lives. With its congested roadways, severe air pollution and scarcity of English spoken (even by taxi drivers), Beijing can be especially intimidating to Westerners. Our bus driver patiently navigated traffic jams, and Crystal Cruises had negotiated access through special gates at some tourist attractions to avoid human gridlock. “Stay together like sticky rice,” cautioned one guide. We wandered through the maze of narrow streets and alleys and joined hoards of domestic tourists at two UNESCO World Heritage Sites: Forbidden City, a museum of 980 buildings that was once an imperial palace, and Temple of Heaven, where emperors prayed for a good harvest. In the surrounding park, seniors played mahjong and cards, practiced tai chi and harmonized in song. That night, Crystal arranged a formal off-ship dinner with musical performances at the Great Hall of the People. The literal and figurative high point of the trip was climbing a section of the 30-foot tall Great Wall, a fortification hand built by slaves and prisoners of war that measures at least 5,500 miles by most estimates. On shore, we savored local favorites like Peking duck, hand-pulled noodles, dumplings, tea eggs and youtiao (Chinese doughnuts). Onboard we enjoyed molecular gastronomy in the ship’s elegant dining room; breakfast buffets, with a few Asian staples, at the Lido cafe; and gourmet meals at Symphony’s specialty restaurants, such as Nobu Matsuhisa‘s Silk Road. One might reasonably argue that this voyage, called “China in Depth,” wasn’t truly deep or immersive. But it was a fascinating, headache-free introduction to the country and ramped up our confidence in returning as independent travelers. Take a peek at the special performance arranged by Crystal Cruises at the Great Hall of the People in Beijing on YouTube. I loved all three of the large cities, each for different reasons!